I love Christmas time. I love everything about it. The cold weather, a season focused on generosity and faith, and all of the fun get-togethers. It’s truly a time of celebrating togetherness. 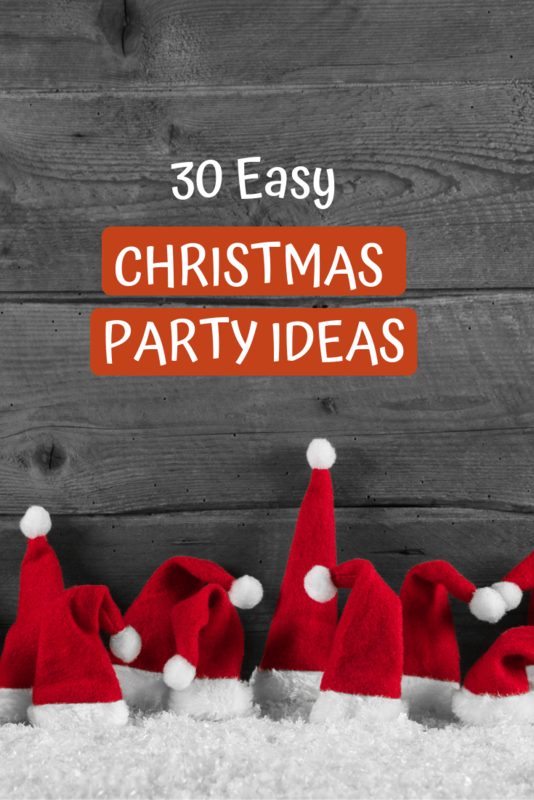 That’s why today I’m sharing 30 easy Christmas party ideas. Because if you’re throwing a Christmas party at home, it isn’t supposed to be stressful. It’s supposed to be fun! Before I share my party ideas, let’s talk about ways to keep things simple. 1. Focus on your people. Christmas parties are great, but the whole point is being together and creating memories. Don’t let the stress of party-planning take the fun out of getting together with your friends. 2. Delegate. Don’t feel like you have to do everything for your party alone (unless you genuinely enjoy it). Delegate some tasks to someone else, either another family member or a guest. Don’t like planning games or activities? Focus on the food and ask someone else to plan the games. Feel stressed by decorating? Let your friend bring the mistletoe and garlands. Do what you enjoy and let go of the rest. 3. Pick and choose. This post is FULL of ideas. Don’t try to incorporate them ALL — just pick 1 thing from each section. The whole point is to keep things simple — I don’t want you to feel overwhelmed by ideas. Just use this post to brainstorm how you want your party to be. Ready? 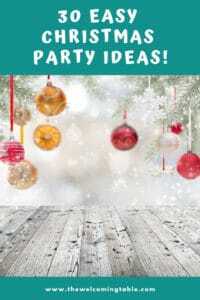 Let’s plan your easy Christmas party! But! If you want to inject an extra bit of fun, themes are a great way to take your party to the next level without a lot of effort. Themes also help give you a little structure. 4. A Progressive Dinner. The party moves from one house to the other for each course in the meal. Appetizers at House #1, main meal at House #2, and dessert at House #3. (You can also throw in a salad course if you want to stretch the evening further.) A small activity at each house is fun, but you can just eat, too. 5. A Christmas Movie (like Elf, A Christmas Story, or The Grinch). Dress up like the characters, eat food from the movie (think spaghetti with maple syrup from Elf — ha!) and you can even watch the movie together. 6. White Elephant Gift Exchange. It’s a classic for a reason! Everyone brings a wrapped gift, and you take turns opening — and stealing them. Sometimes the gifts are nice, and sometimes they’re funny. A combo of both is fun. 7. A Gift-Wrapping Party. Ask each person to bring a roll of wrapping paper and any gifts they need to wrap. Then spend the evening wrapping presents with each other’s wrapping paper. 8. Fondue Party. Fire up your fondue pot, open a package of cheese fondue, and dip bread & vegetables. A fondue party makes for a warm, cozy evening together. Now that you’ve decided what kind of party you’re having, it’s time to decide who to invite. 9. Think in categories. I like to think in categories and invite a specific friend group when I’m planning a get-together. You probably have different groups than I do — maybe work friends or your running group or your DIY crafty friends. Maybe you want to invite everyone you know. That works, too! 10. DIY party decorations. But if you’re looking for some DIY decorations (or something to keep your kids occupied while you’re getting ready for your party), here is a video with some super creative ideas. I love the DIY lanterns and the hanger wreath. 11. Use paper plates. If cleanup is what is keeping you from inviting people over for a Christmas get-together, you officially have my permission to use paper plates. We use paper plates every time we have a large group — even at Christmastime. And these days, they make such fun styles, whether you’re looking for elegant, classic, or festive. 13. Make it a potluck. Don’t be a hosting martyr — let other people bring food, too! Ask everyone to bring an appetizer or dessert and you provide a couple of heavier snacks like sliders. If you’re using a theme, ask them to bring a dish that goes along with it. Or if you do a food station (see below), everyone can bring 1-2 things to contribute. 14. Set up Christmas party food stations. Food bars and food stations are all the rage these days. And why not? They’re fun and in a day of food allergies and special diets, they’re customizable. 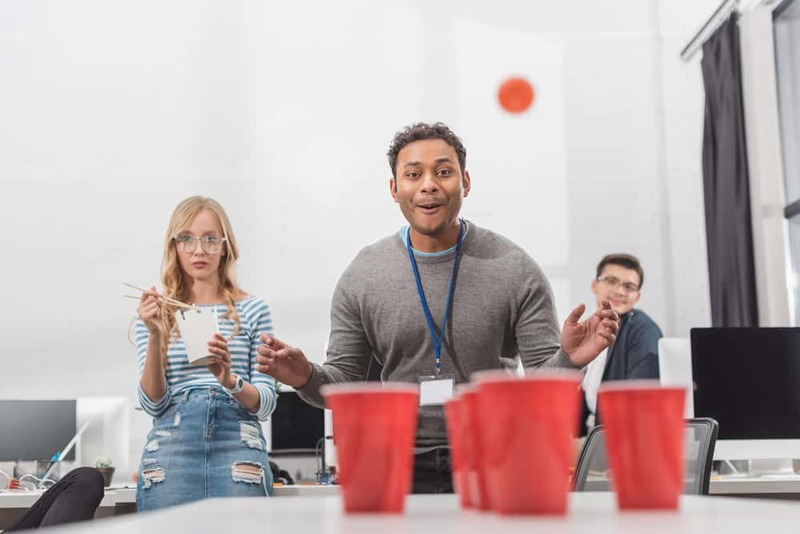 If you want some simple things to do at your party, here are some super easy but fun games to play. 20. Minute to Win It Games. Have you played them before? You compete on teams to play silly games that you have to finish in under a minute. They’re so fun! My family has played them several times before. And trust me — you haven’t lived until you’ve watched your favorite people try to move an Oreo from their foreheads to their mouths without using their hands. 22. Left/Right Game You play this game at a gift exchange. Everyone starts with their own gift on their lap, and a Christmas story is read. The catch is that the story uses the words, “left” and “right” a lot, and every time you hear one of those words, you have to pass the present on your lap that direction. It makes for a lot of laughter! 23. Charades. It’s an oldie-but-goodie. Write down clues — Christmas movies, characters, things you find in winter — and everyone takes turns acting them out without speaking. 24. Heads Up App. Talk about easy — nothing to organize with this game. It’s an app you can download onto your phone. If you’ve played the game, “Head’s Up,” it’s the same concept. You put your phone on your forehead, it shows your friends a clue, and they all act it out for you to guess before the timer goes off. Once you’ve guessed the right answer, you flip it down for a new clue. 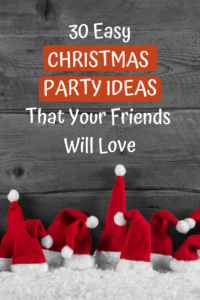 The last 6 easy Christmas party ideas are party supplies that both help take the stress out of your party and add festive fun. 25. Photo Booth Props — photo booths are such a fun way to capture memories from your party, and these are great. 26. Photo Backdrop — this pretty backdrop is the perfect background for your pictures. 27. Glittery Christmas Cupcake Toppers — a fun way to add holiday cheer to some simple cupcakes. 28. Christmas Biodegradable Straws— good for the environment and fun for your party! 29. Christmas Plates & Napkins — lots of options for holiday-patterned paper plates and napkins. 30. Fancy Christmas Glasses — these hilarious Christmas glasses would be a great party favor to send home with your guests. 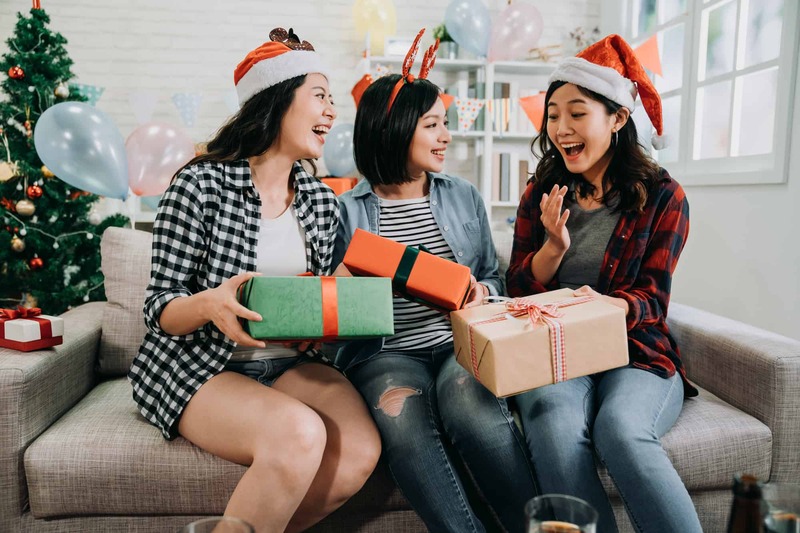 Throwing a Christmas party at home is such a fun way to celebrate the holiday season with your friends. 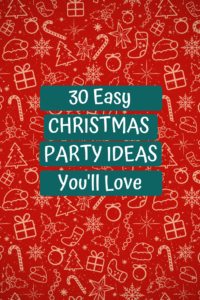 And with these 30 ideas, you’re sure to find several that will make your party easy to host and more importantly, a whole lot of fun. Looking for gift-giving ideas? Check out The Best Etsy Gifts for Entertaining and my Gift Guide for the Everyday Hostess! And also 38 of the Best Christmas Food Gifts for Neighbors! Want to gain confidence to invite more people over for dinner? Join my Invite Them Over Challenge where I’ll turn you into a confident hostess in 5 days!